Hey party peeps! 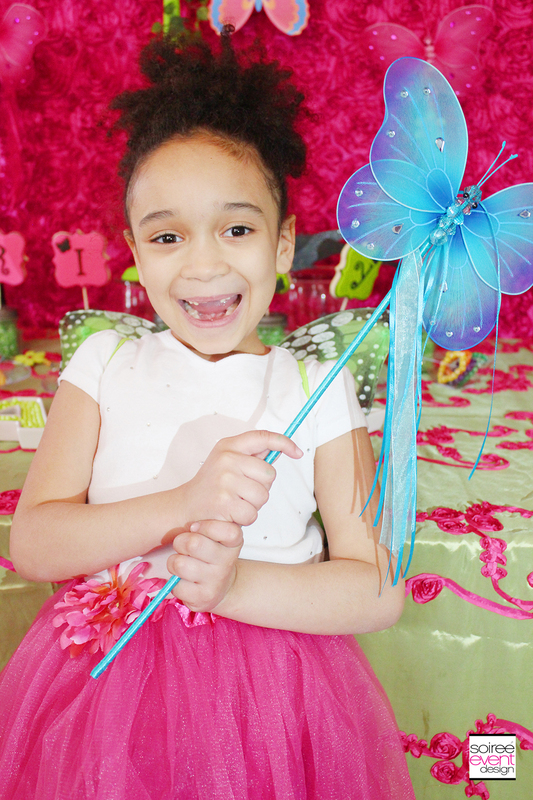 Okay, okay….first of all, I must admit that I am just now getting around to posting my daughter RILEY’S FAIRY GARDEN BIRTHDAY PARTY! This is her 7th birthday party and she’s now 9! OOPS…I know…I know…but better late than never right? Come on guys…being a Mommypreneur is HARD! The struggle is real. 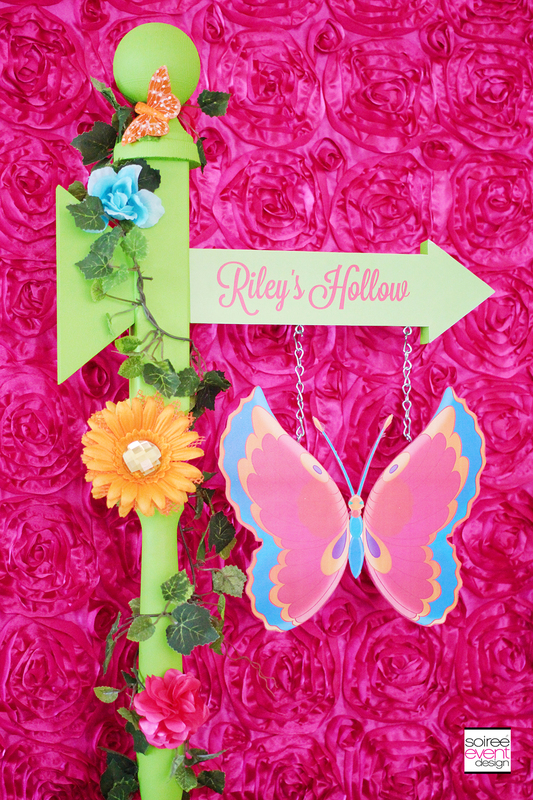 Now that we’ve got the admission of my mommy fail behind us, let’s enjoy this Fairy Garden Party along with my signature “Girlfriend Tips” that I hope will help you host your next party with less stress. 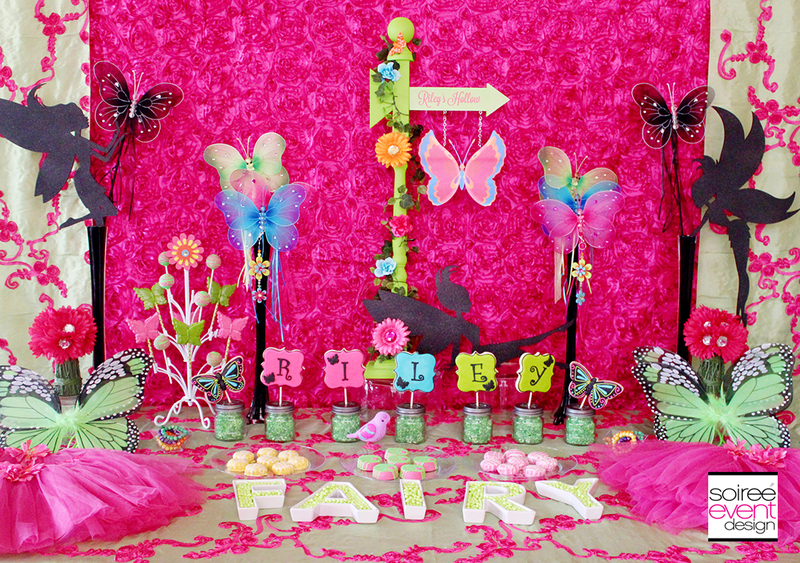 SET THE SCENE FOR A FAIRY GARDEN BIRTHDAY PARTY! 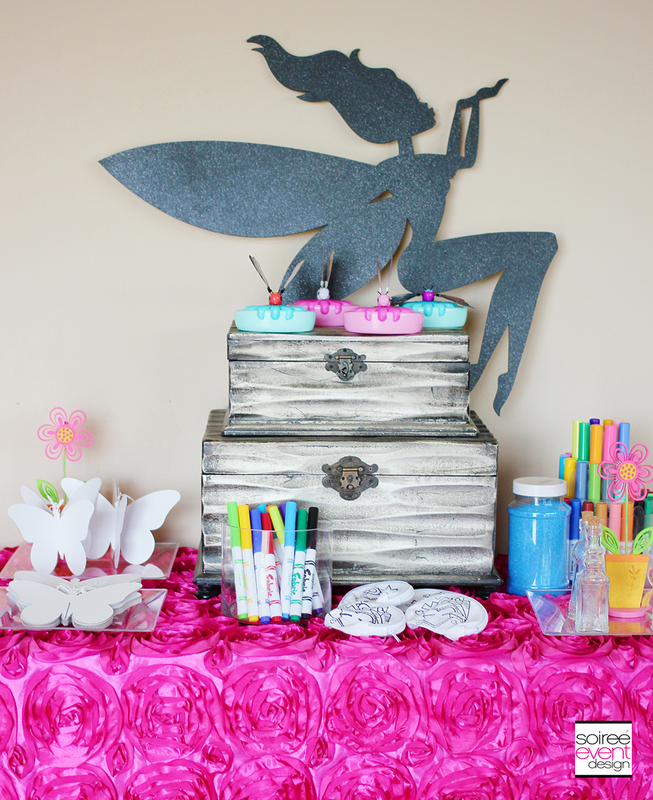 For this party, I wanted to put a different twist on a Fairy theme by adding black elements to the brightly colored party decor. Typically you wouldn’t see black used in a fairy party, but I think it looks AMAZING. 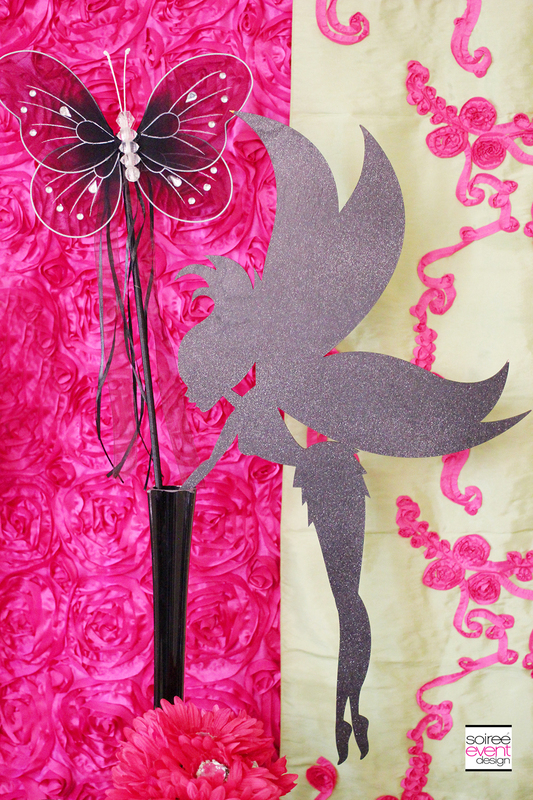 Especially these wood cutout fairies by Ten23 Designs that I spray painted in a black glitter spray paint. 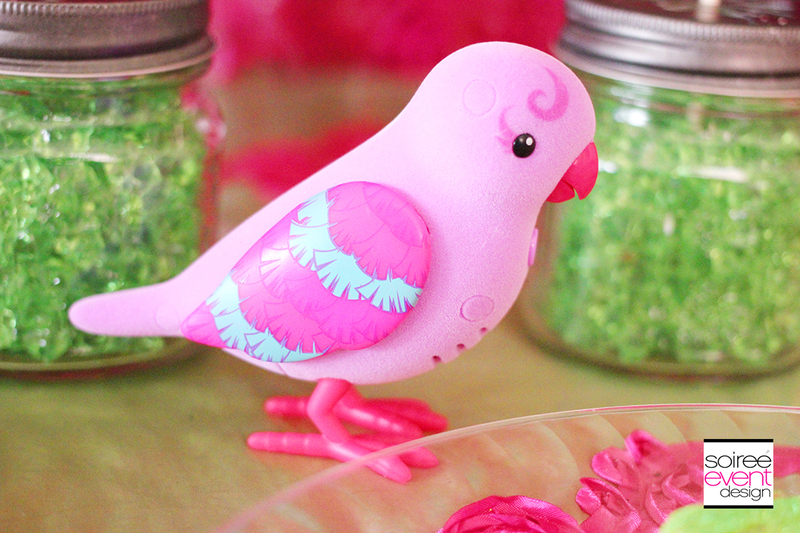 I also hid this Little Live Pet’s Tweet Talking Bird (one of Riley’s birthday presents) on the table. She was SO excited when she found it. The showstopper was this AMAZING custom centerpiece by Ellery Designs. I mean, really?! How stinkin’ cute is this? Riley loved it so much it is now in her room. 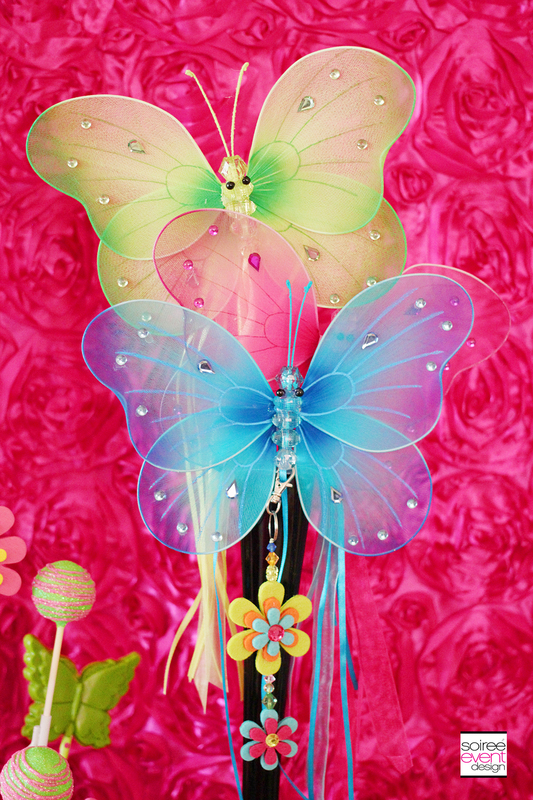 How cute are these black tower vases with black and bright colored butterfly wands and simple bling flower bouquets? 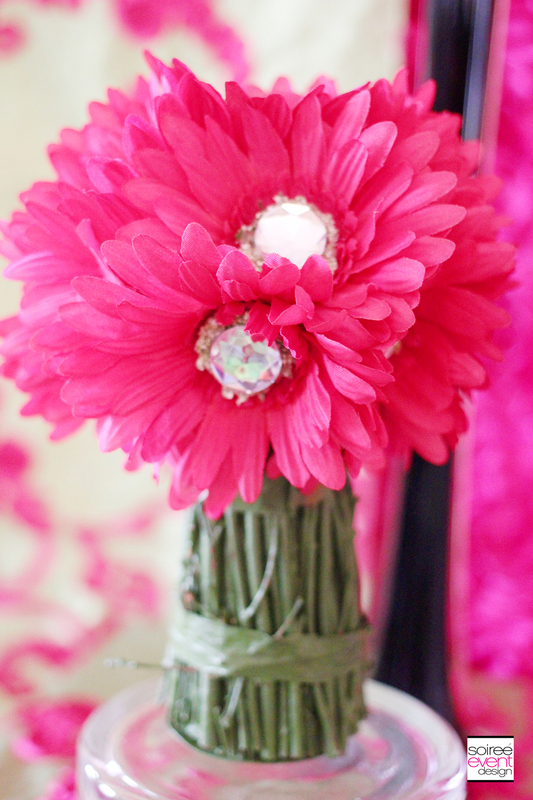 I hot glued flat-backed rhinestones to the middles of the flowers for a bit of sparkle. GIRLFRIEND TIP: You don’t always have to have an expensive dessert table at your parties to have a wow factor like this. You can simply create a double-duty table by creating a dessert table and party favor/dress up station on one table like I did here. THE GARDEN FAIRY CAME FOR A VISTI! 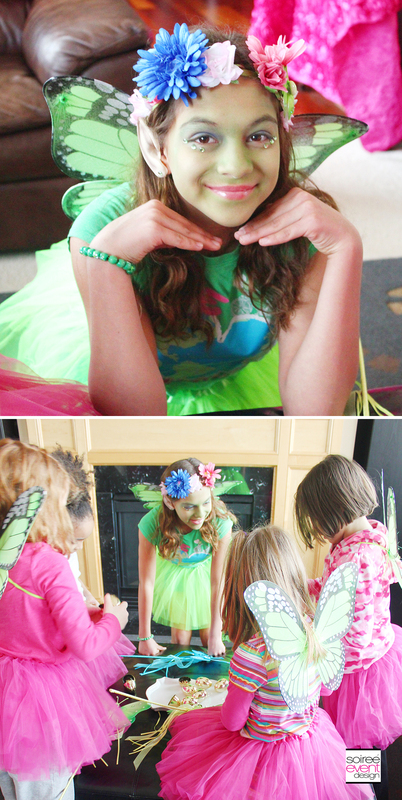 My older daughter, Faith is AMAZING at cosplay and came up with the idea to surprise the girls and attend and host the party as the Garden Fairy. She was so AWESOME at staying in character and truly memorized the girls when she fluttered into the room. 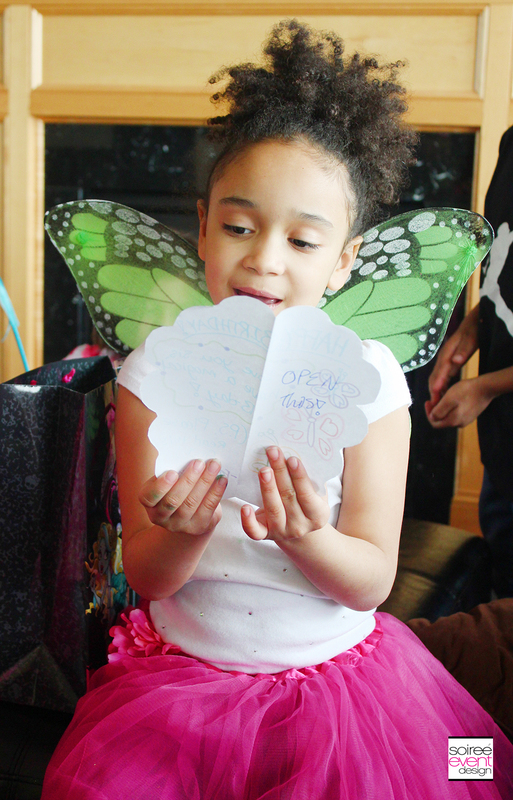 She gave them all funny fairy names and proclaimed them official fairies with their own fairy wings, butterfly wands and tutus to wear for the party. Once they were all official fairies, she sent them on a Fairy Scavenger Hunt to look for magical golden eggs. 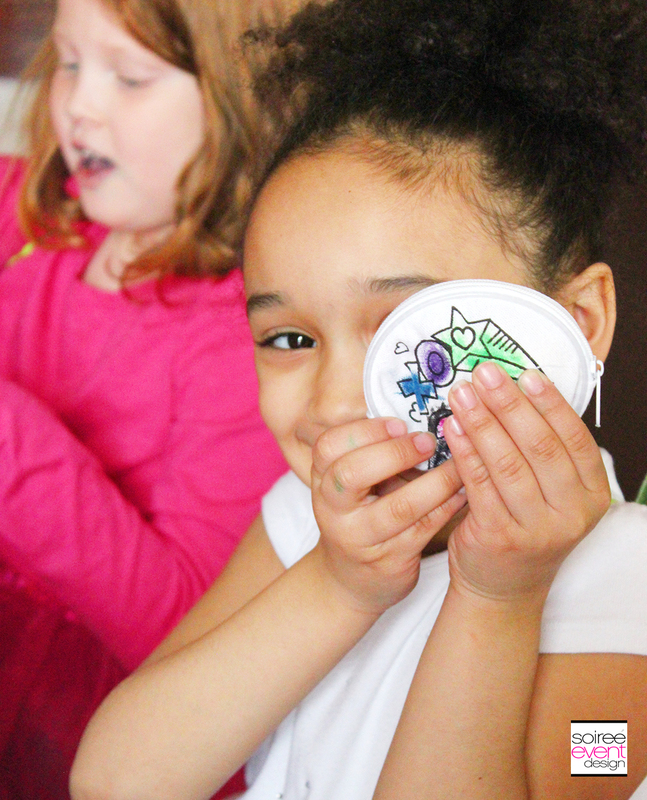 Once all the eggs were found, she gave each of the girls their very own interactive Little Live Pets Butterfly toy to take home. 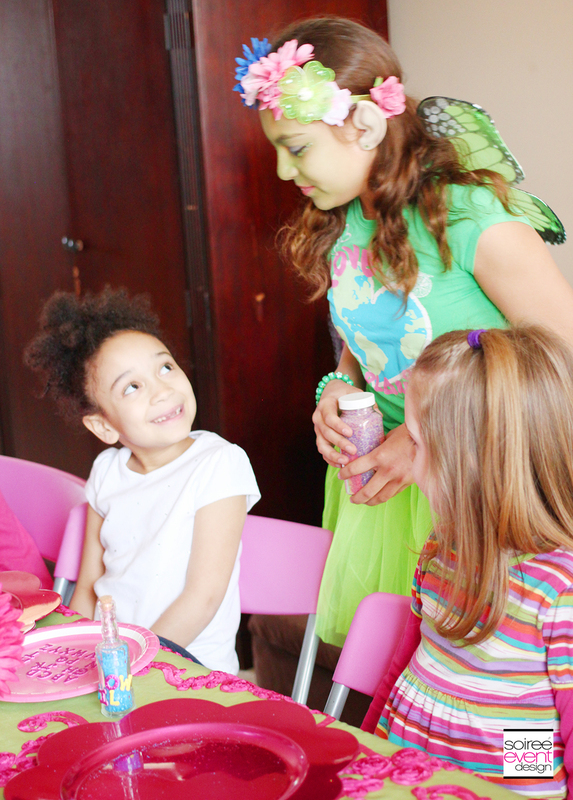 The Garden Fairy then guided the girls to the Fairy Garden Craft Table full of fun fairy garden crafts. 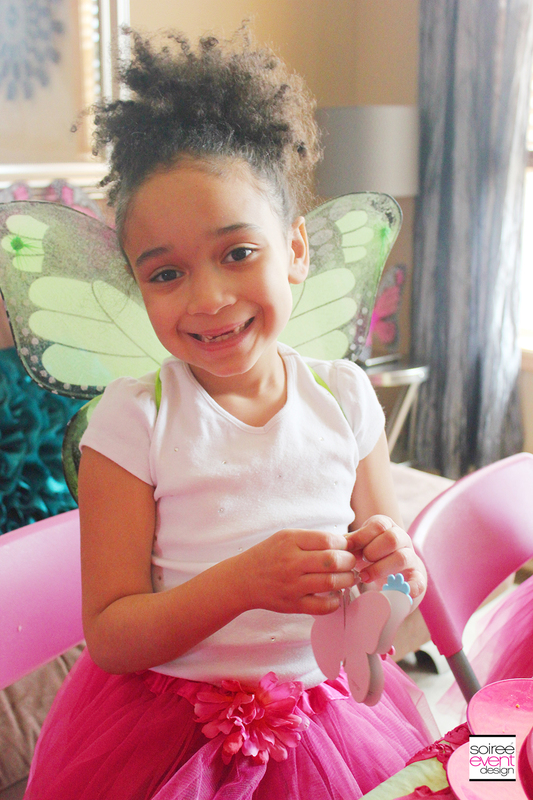 Oriental Trading has lots of craft projects and supplies that match a fairy party theme like these 3D butterfly ornaments, fairy bottles, colorful sand with funnels and color-your-own coin purses with fabric markers. 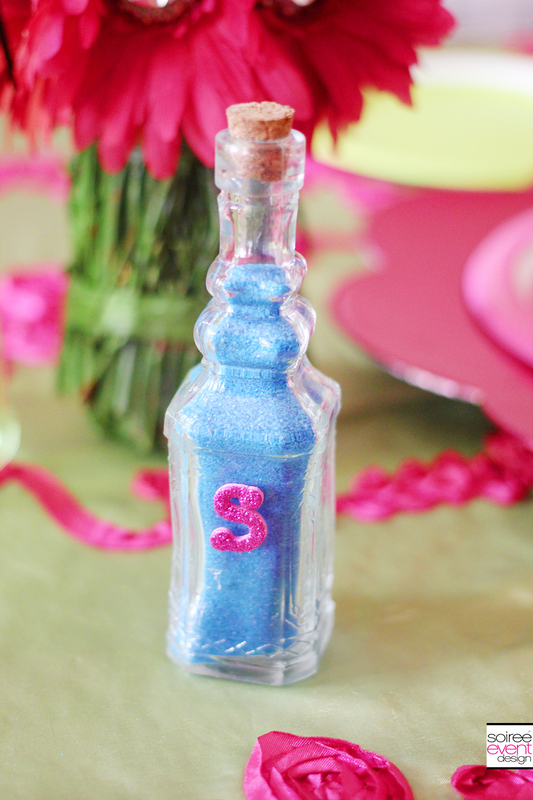 The kids then followed the Garden Fairy over to the Fairy Garden Dining Table where they had fun decorating fairy bottles and filling them with sparkly “fairy dust” (colored sand) and coloring their own “fairy wish” purses to hold all their imaginary fairy wishes! It was super cute how Faith stayed in character the whole time which added a whimsical touch to craft time! GIRLFRIEND TIP: When decorating your party space, use one table for dual purposes. Here I set up a Fairy Garden Dining Table that also doubled as the table for the girls to do all their crafts. Just have one set of paper plates for crafts and replace them with another set of paper plates for eating. STORY TIME WITH THE GARDEN FAIRY! 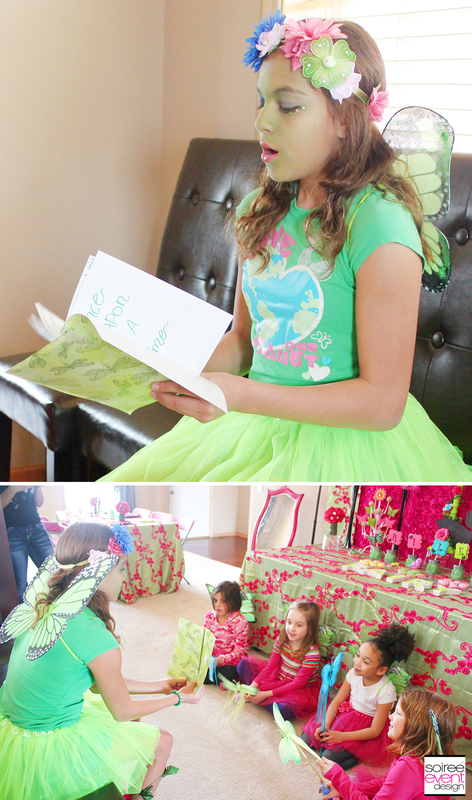 The Garden Fairy wrote her own Fairy story and read it to the girls! They were hanging on to her every word. It was adorable! Then it was time for cake and desserts. SERVE FAIRY GARDEN THEMED DESSERTS! I enlisted the help of my friend Bethany of Auntie Bea’s Bakery to design cookies to match the party theme. 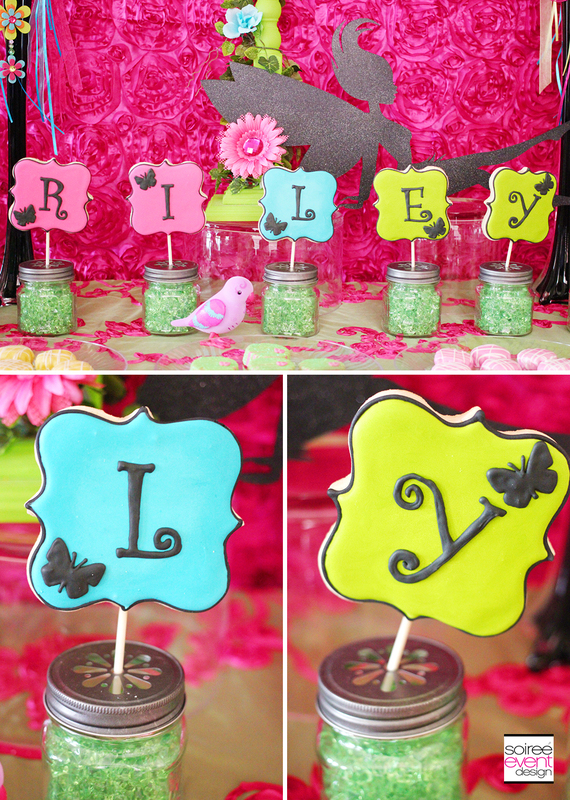 She hit it out of the park with these sparkly black butterfly cookie pops and she spelled out Riley’s name in cookie pops! How cute are these! 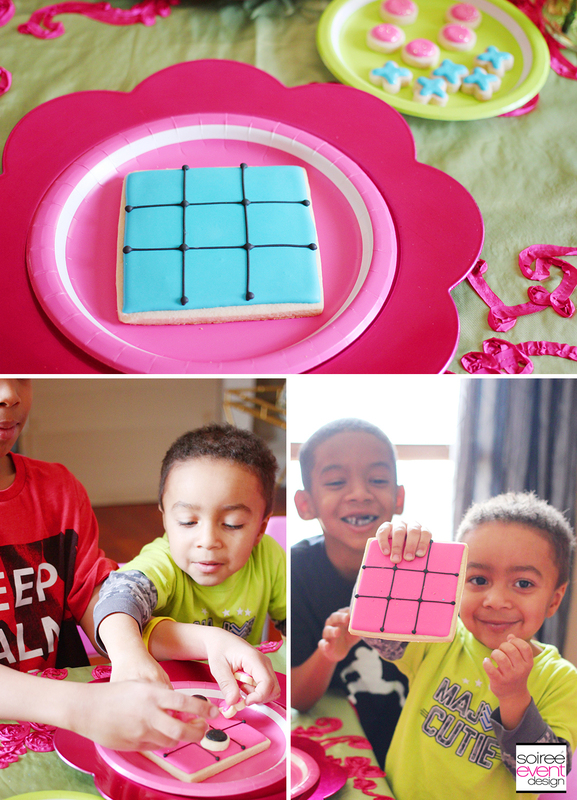 She also made these super cute Tic-Tac-Toe Cookie Sets that the kids could play with AND eat! They ALL had a blast with these. You could also individually wrap the sets for each guest to take home, but I loved seeing the faces of the kids when they realized they could actually PLAY and EAT these! I also had some butterfly chocolate lollipops, sparkly cake pops and chocolate covered OREOS made by the amazing Sparkling Sweets Boutique. 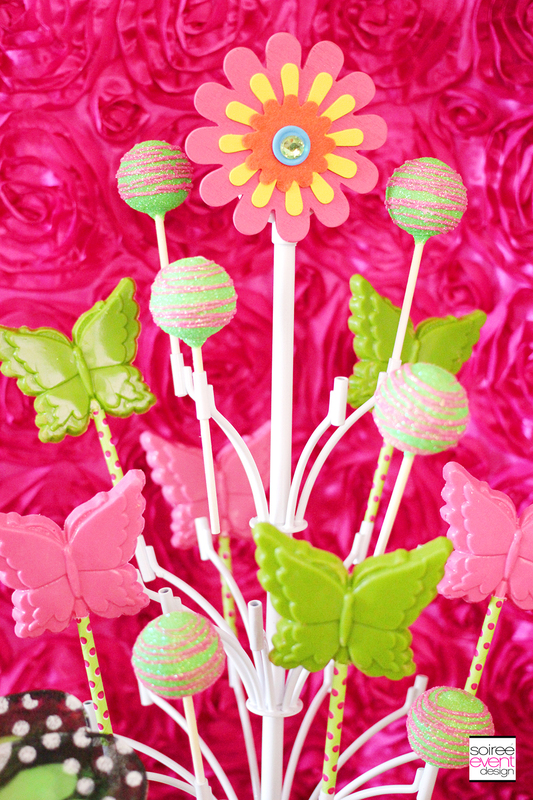 I displayed the butterfly pops in a lollipop holder so they looked like they were flying around the table. 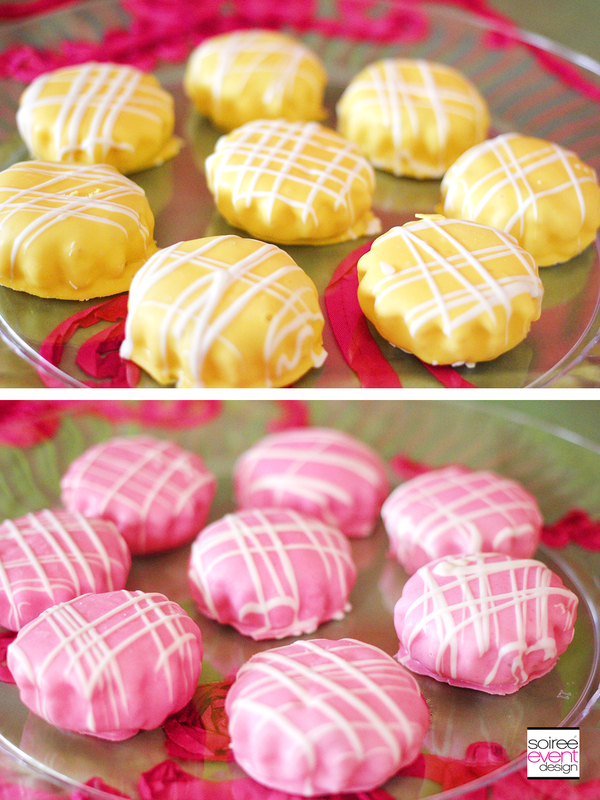 GIRLFRIEND TIP: As a timesaver, you can pick up store-bought sweets that match your party’s colors like these iced cookies I picked up from Target. They look amazing, right? 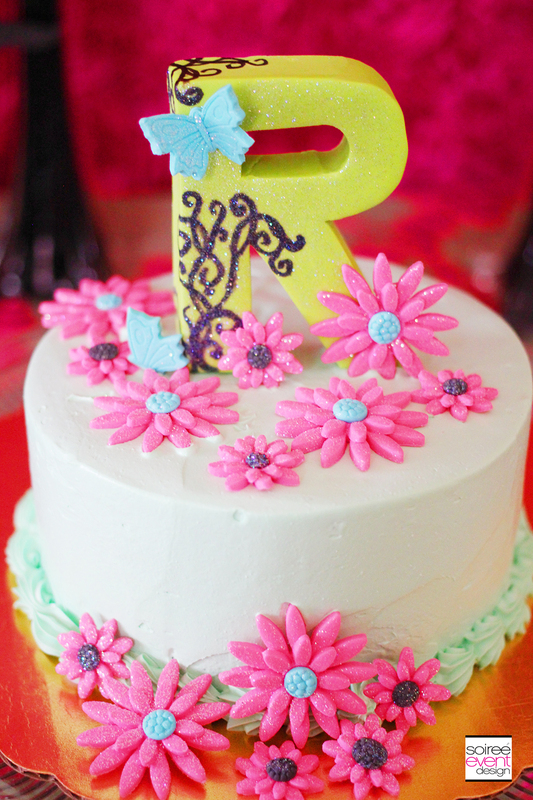 DRESS UP A STORE-BOUGHT CAKE WITH A CUSTOM FONDANT TOPPER! Okay, THIS is a tip that I use all the time. When hosting my kids’ parties, I almost always order them a store-bought cake. I order it plain (no writing) and ask the bakery to simply use icing in the colors that match my party. THEN…the magic happens! I top it with a custom fondant topper and additional fondant flower decorations that match the party to give the cake a custom look. My friend Brittany at Edible Details has made my kid’s toppers for their birthdays the past few years. She also ships them, so you can get a custom fondant topper for your next cake. One thing I LOVE to do at my kid’s birthday parties is to let them open up their gifts with their friends on their own. It was fun to watch the girls get so excited to give their presents to Riley and gather close to see her reaction when she opened them. 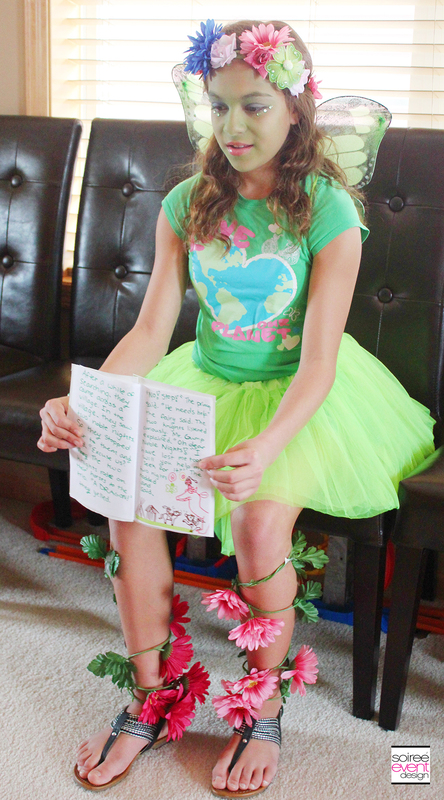 Watching Riley read the handmade cards her friends made for her just melted my heart! I forgot to mention that Riley’s birthday is in March and we are in the midwest, so it is always still winter around here on her birthday every year. So when she said she wanted a Fairy Garden Party, I was up to the challenge! It was a joy to be able to decorate the party with a garden theme that made us forget about the cold weather outside. 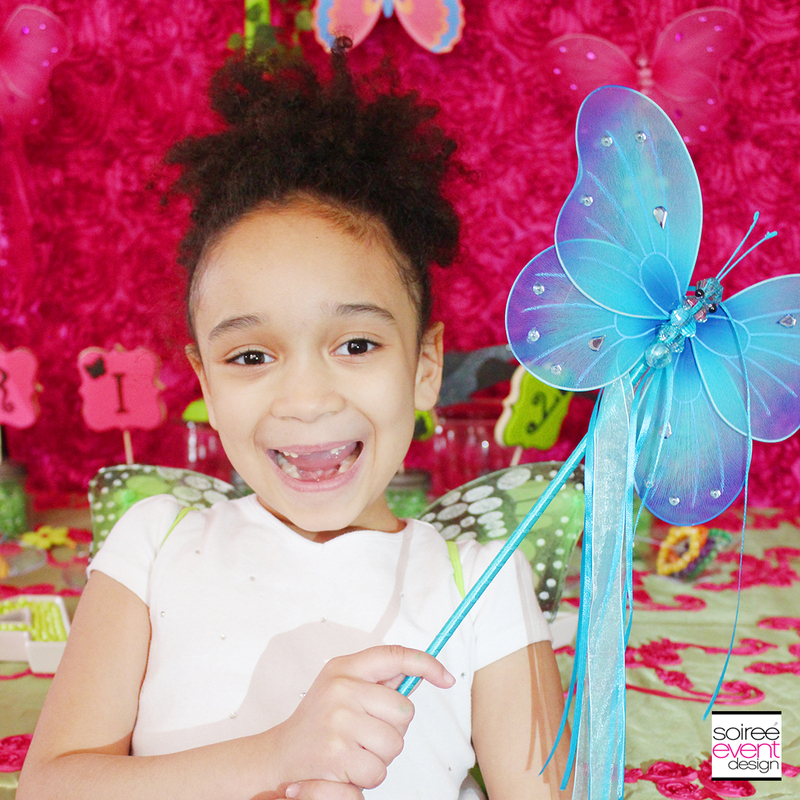 The smile when she walked into the room was PRICELESS and I’ll never forget the look of joy and wonder on her face as she watched her big sister transform into a real live garden fairy! I hope this has given you some ideas for your next Fairy Garden Party. 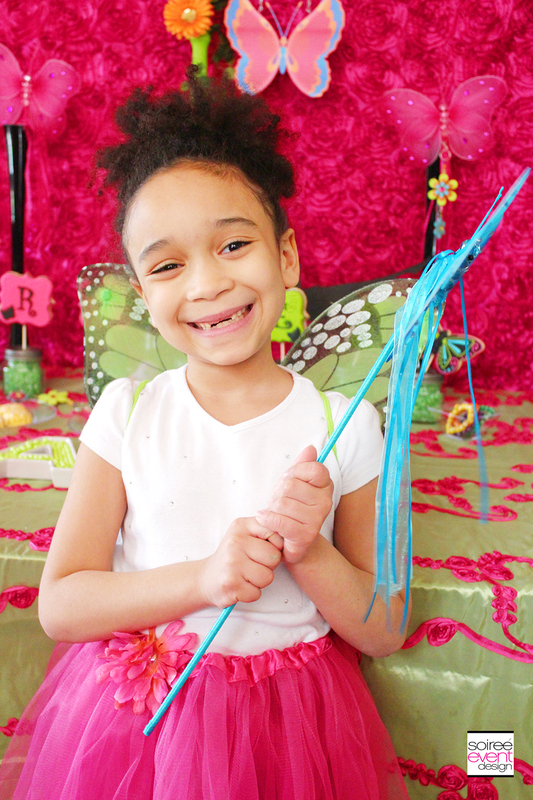 Be sure to check out my other FAIRY PARTIES – Rainbow Fairy and Twilight Fairy. Here’s a list of some of the fabulous vendors I used so you can recreate this yourself. 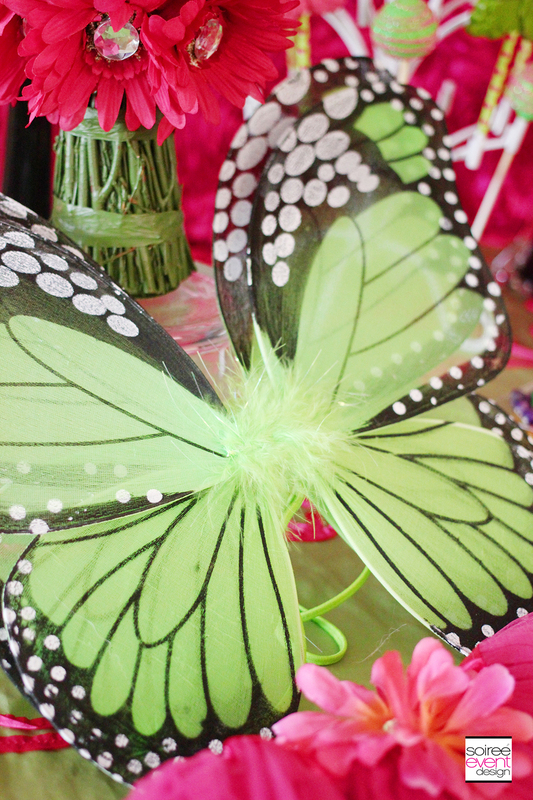 What a fun birthday party theme for little girls. I am sure my nieces would love that. That is ADORABLE!! I love it! This would be almost every’s girls dream for a party! I know a few girls that would love this for their next party! That’s so true! A magical experience like this would create some lasting memories. What a fun way to celebrate a birthday! Wow, the fairy colors were super impressive. 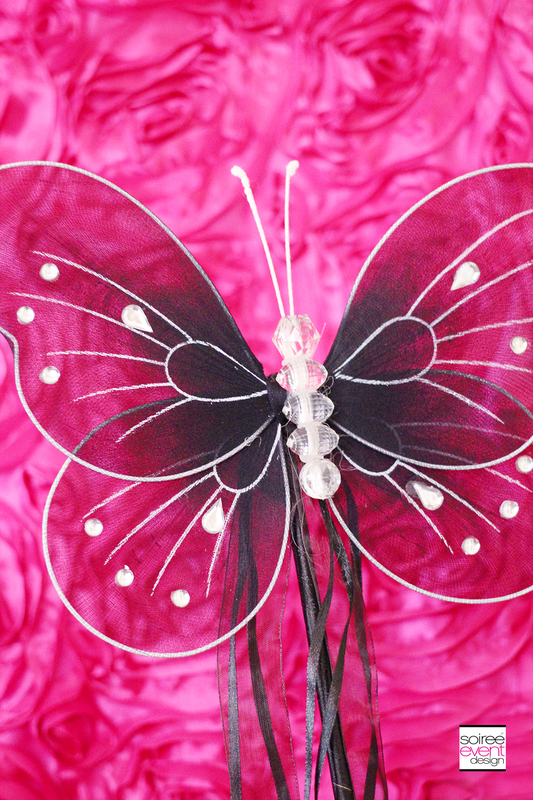 I like what you were able to do with all of the fairy wings and butterfly wings you found too! The fairy story time was a great idea! What a fun party theme! You thought of every angle. I want a party like this for MY next birthday. Wow, looks like a little girl’s dream. Quite an impressive party. This looks like the most amazing party! Well done! 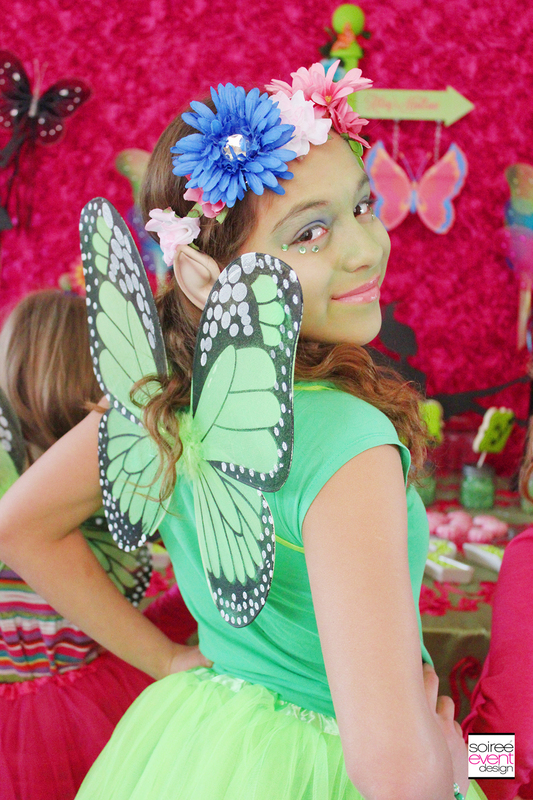 I loved fairies as a little girl and would have loved a party like this!!! This is such an amazing party! My daughter would love something like this. 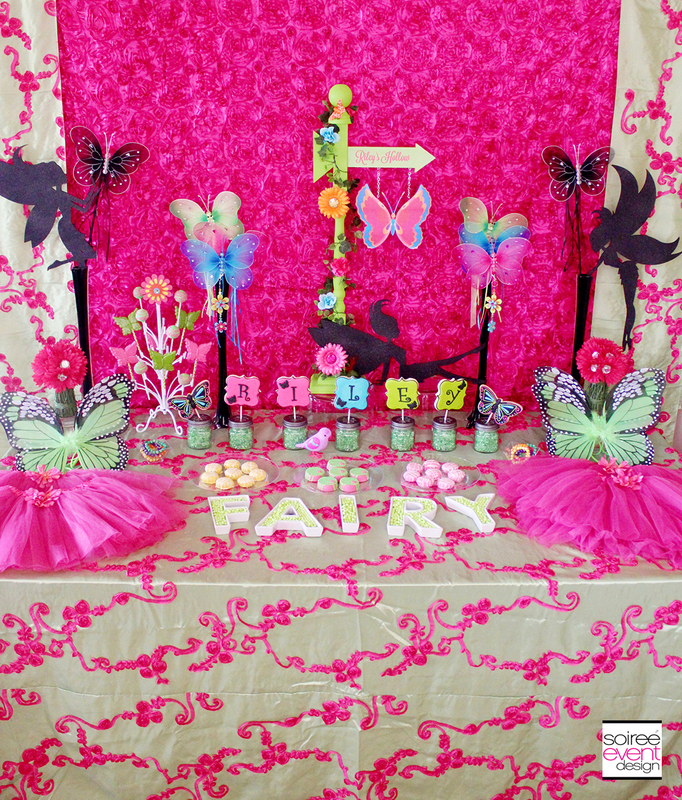 What a bright and beautiful fairy themed party. I’m sure Riley was so happy how the party turned out! So fun! What an amazing party! I would have loved this party as a girl. Great photos! My daughter would have loved this when she was younger. It’s great that your older daughter helped by being the Garden Fairy. That is an awesome looking setup. I dare say that it might be the best birthday setup that I have ever seen! Awesome job! Thanks for sharing. I love the photos and the idea of a fairy garden party. I would love to set this up for my baby sister. 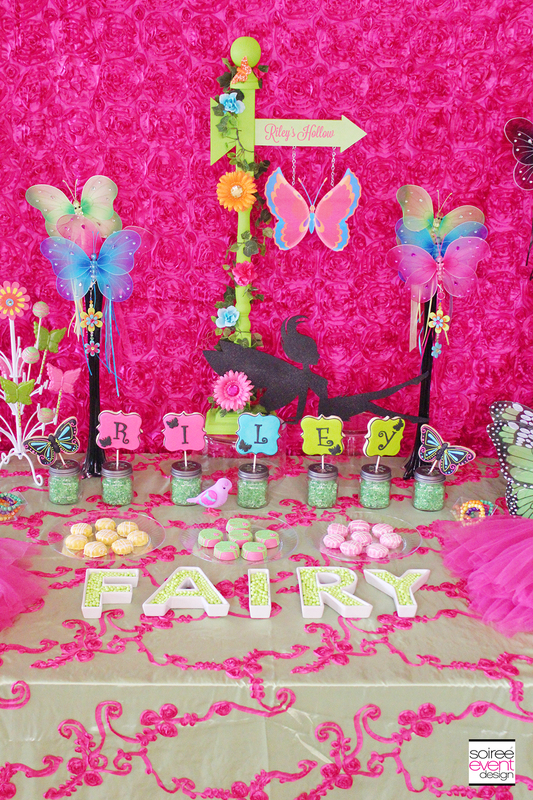 Wow this is such a great fairy garden birthday party! My daughter will definitely love this idea! So lovely! So many amazing ideas! This is such a great party. I love the cookie tic tac toe! Oriental trading is such a great place to get trinkets from. They really have great deals and a wide variety. This sounds like an great party. So many amazing ideas! This is such a cute idea! I wonder if I could talk my daughter into this theme for her birthday next year? My 3 year old daughter would go crazy over this birthday party! I love how you did everything, that backdrop piece was amazing! What a cute party! I love the candies and the cookies. Everything’s just perfect for the theme and the kids look like they’re having a blast too. This is a dream for every little girl! So beautiful and I love all of the details. That is such a fun party and it’s also nice when it’s done during the summer. It’s well decorated, from the walls and tables down to the food. Such a cute party. I would love to have a room in my house decorated like this. Your daughter is so blessed to have a mom like you. You throw her the most amazing parties and I love this theme! That is such a cute setup! I love your party planning. You go so far beyond! I completely feel you on the posting 2 years late- happens all the time to me. As far as the party- the custom sign really does tie the whole display together, but those tutus are a genius touch as well. I’m absolutely in love with everything about this party set-up! Those fairy wands are precious, and the fairy wish purses are too cute! Awesome party theme! Any little girl would love to have a birthday party like this. I am bookmarking this page and sharing it when I come to learn of a friend planning a birthday party for her child. This is such a fun party idea! My daughter would have a blast, dressing up as a fairy! Adorable. There’s so many great little touches here. 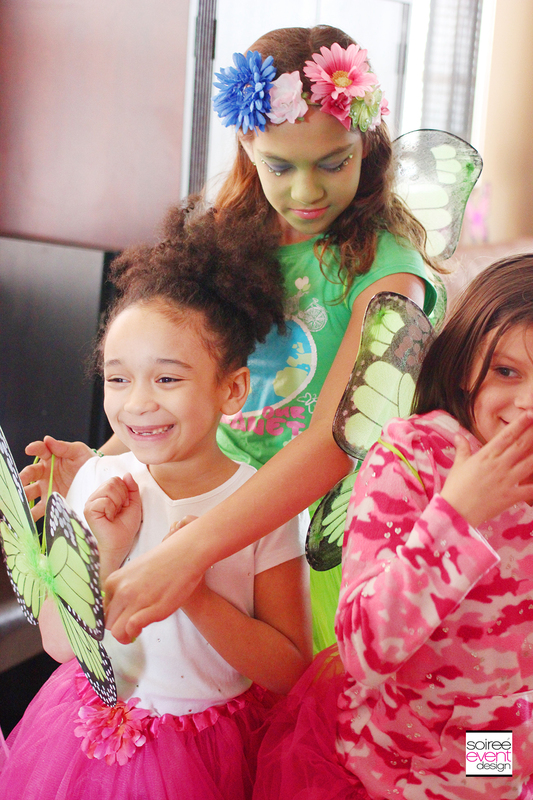 Everyone clearly had a great time and enjoyed the magic from all the “fairy dust” ;)! What an awesome party theme. I love the decor and those tic tac toe cookies were too cool! Oh my goodness! What a cute party theme. The pictures really show the bright colors. It looks like they had a terrific time! 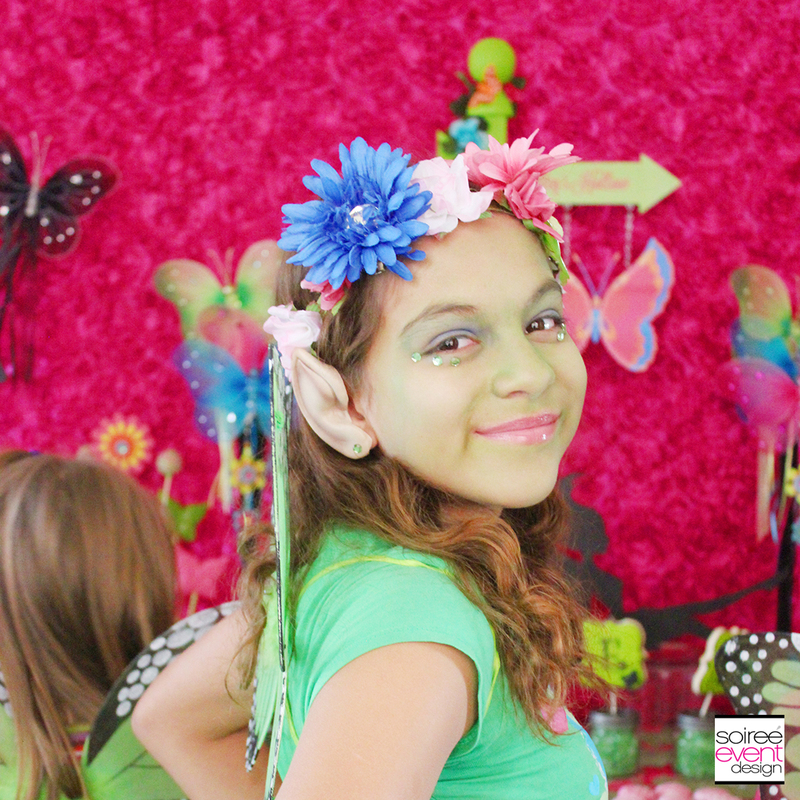 What an amazing party – and Faith’s makeup looked professional! Oh, I wish I had children. This is a great idea for a little girl’s party. Love it. I am seriously impressed! You thought of ever detail from the cookies to the ears and wings. Well done! Looks like every fairy lover’s dream. This is just way too cute! I want my own fairy dust! What a fun party you threw for Riley. I love the whimsical sweet treats, tablescape, and decor! I absolutely love this party idea!! My daughter would have loved a party like this or to go to one!! You did an absolutely amazing job with everything you did here. I know my daughter would loved such a thing at that age. The only thing I don’t like is the fondant. I am just not a fan. It looks like a fun party! The theme is so cute as well as the crafts and fairy stuff. You did well as it looks on the photos that the kids really enjoyed the party. 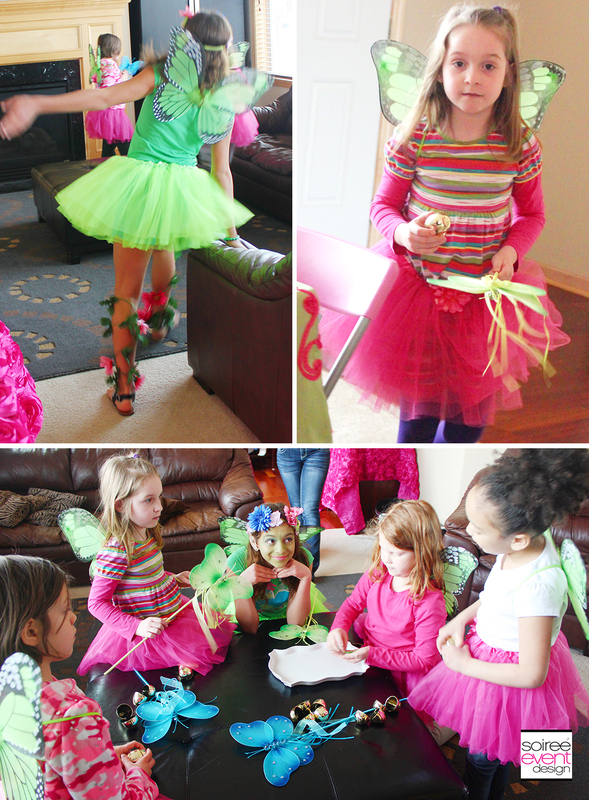 My Daughter would love a fairy party like this. I bet this was a huge hit with the kids. You did an amazing job! If I had a daughter, I would love to have a party like this! Oh how fun. I love the little pink birdies. I could go for that for me! Omg how beautiful and cool! Happy bday Riley, your party is so funny and adorable! Wow this is awesome and a blast! Love the crafts and the party favors. Happy Birthday Riley! 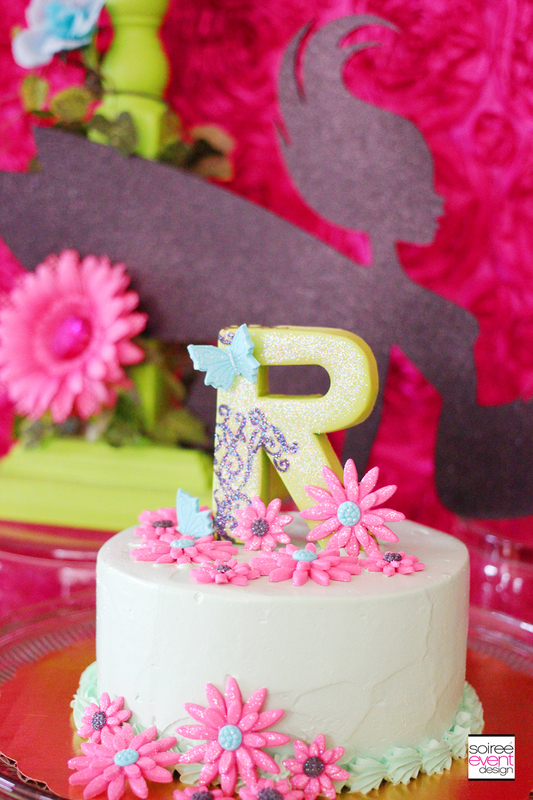 What a fun and whimsical theme for a birthday party. My girls would have loved this when they were younger. Can I dress up as a garden fairy? I wish my daughter was little again so I could do this for her. Looks awesome. Indeed you don’t need much to get the wow factor! You did great! Wow, what a beautiful set up! This is something I need to do for my girls. I think they would really enjoy a fairy themed party. What an amazing party! 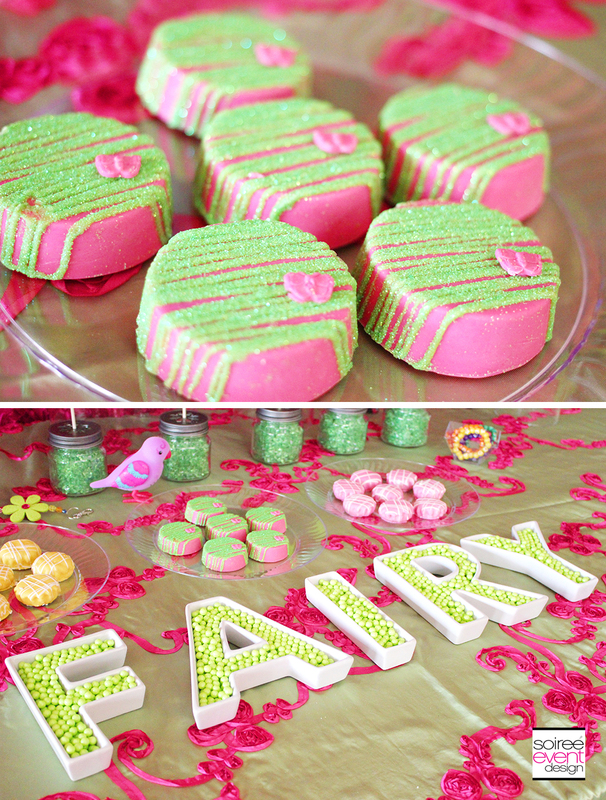 My daugther loves everything fairy and I’m sure she would love to have a themed birthday party! Love the dessert table you created! This is so fun and I would have loved to have a party like this as a little girl. You did such a great job and paid attention to all the little details we forget about. Hope it was a fun day for you and your family as it sure looked like it. It was SO MUCH FUN! I actually got to enjoy it this time. It helped that my older daughter hosted the party so I could snap so many photos of them having fun! That’s an awesome layout for the party. The action pics you got are awesome. I love the setup of the party! So colorful. Surely kids will enjoy the designs made plus their costumes are very adorable. 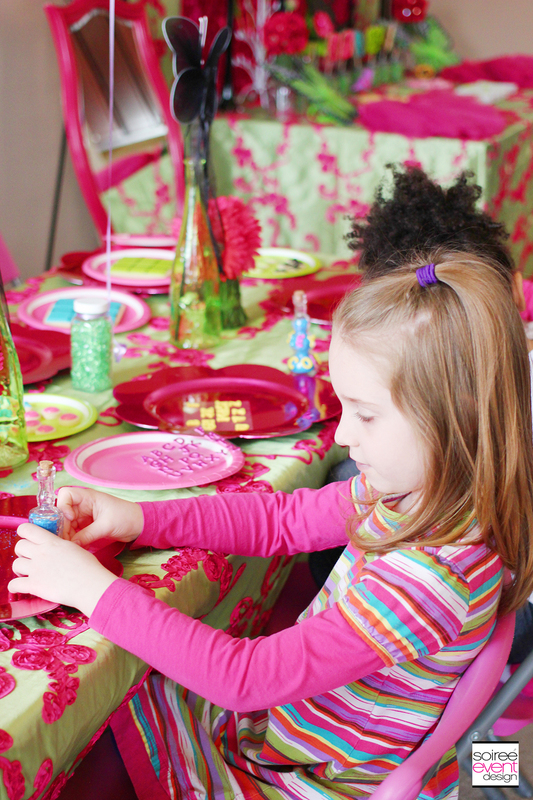 This is a great colorful party for any little girl. I love the colors and decor! This is the cutest birthday party ever! I love it! Wow! This just looks so amazing! It’s my little girl’s birthday soon and this have given me some ideas! Thank you for sharing. Glad you got some ideas! Such a cute party! We are doing a party in a month for my daughter and I bet she would like this! That is so much fun for sure! Oh, this is so precious!! What incredible ideas for a birthday party! I wish I was a little girl again, haha! Happy Birthday Riley!! 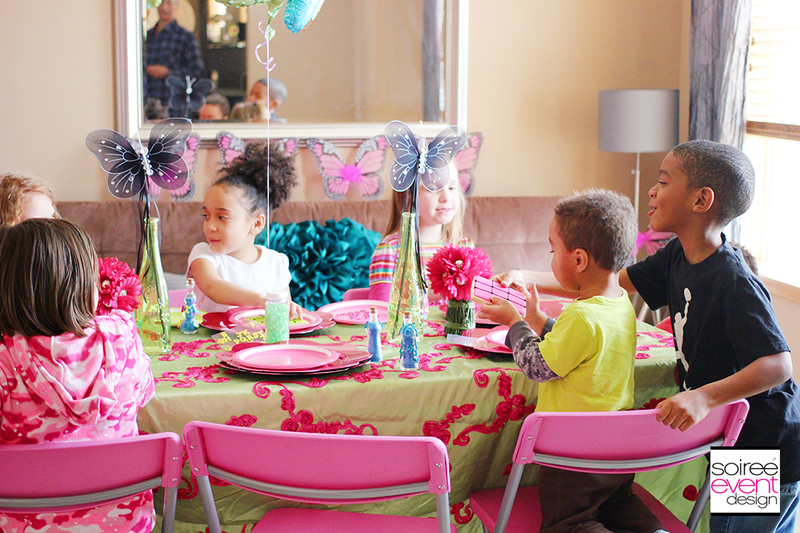 Oh my goodness, how cute is this party! So bright and cheery! I bet the girls all had a blast. What a beautiful party! So bright and vibrant in color. I love all the decorations and activities. 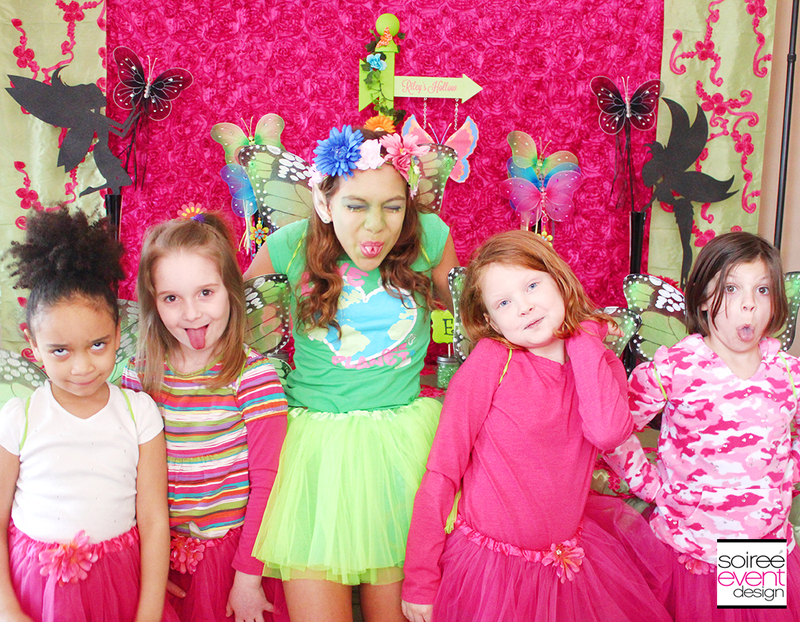 What a great party for your little girl! I particularly love the crafts space and the scavenger hunt! What a nice birthday party themed and I love this for my niece everything was so perfect. What a fun idea! 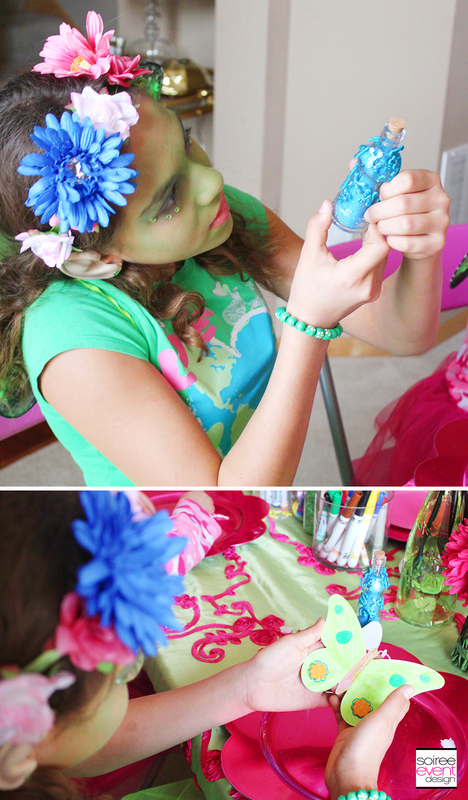 My niece is a huge fan of fairy!She will surely love this ideas. This is totally cute party theme for a girl, I’m sure that my niece would love it for hr 7th birthday. Oh my goodness! What a lucky little girl! My daughter would absolutely flip for this! This was absolutely adorable! I have 3 girls, all who love fairies. Pinned for later! Yay! 3 girls means lots of girl parties in your future! Omg what a cute party setup!!! Totally something my daughter would love!! 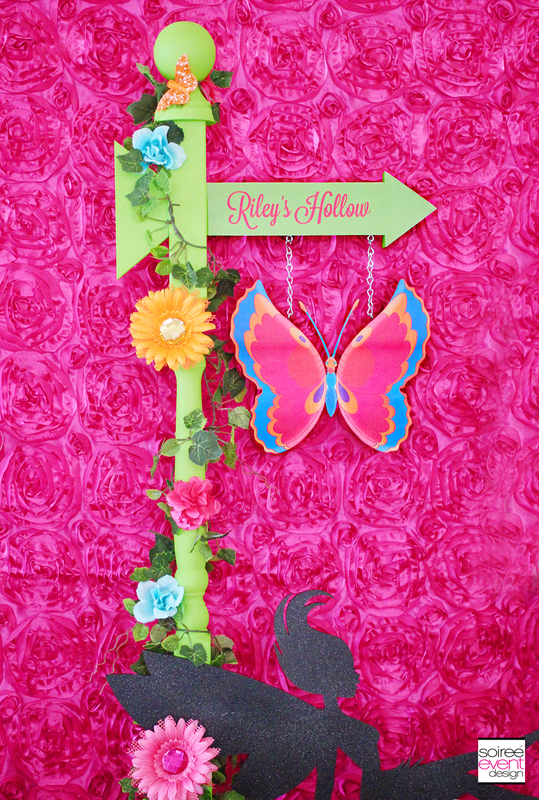 This is beyond an adorable theme for a party! You have so many great ideas to go along with it as well! My daughter would love a party like this for her birthday. All the faries and all the pink! This is so stinking cute! You are a party planning genius. Everything you do is to the Nth degree! I cannot let my daughters see this because they are going to want a fairy birthday too. Heck, they’d want just a fairy playdate too. Um. Oh. My. Gosh. Am I too old to request you throw me a party like this?! This is wedding-worthy! So gorgeous! You did an awesome job! This looks like such a great party for little girls! I liked your tip about dressing up a store bought cake! This looks like a fantastic theme for a party. I would love to have a fairy party for myself and my girlfriends. The wings are so fun. What a great theme! Such a great idea! Love all your tips, will definitely be sharing your post! Can we just say this is the coolest little girls party in the history of EVER! My daughter is begging for this now! All your pictures are so cute and fun to look through! Yay! Thanks so much! So excited your daughter loved the party. You should totally do it for her! Super cute and do creative. If we had daughters this would be our life. I am sure my younger kid would like this. This is really a cute idea! 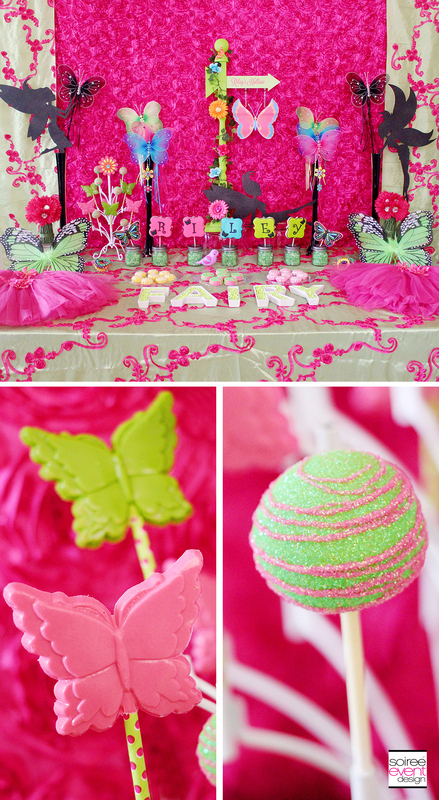 Such a perfect theme for little girl’s party! Everything is so beautiful. It is nice to add special and personal touches to a child’s event. 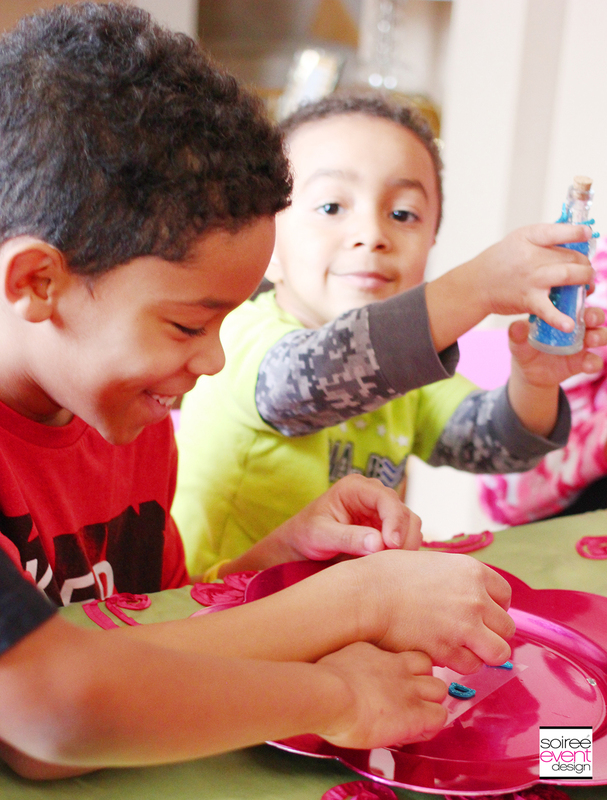 This is such a fun, bright, and creative party! This looks like something my little dreamer would love for her party. 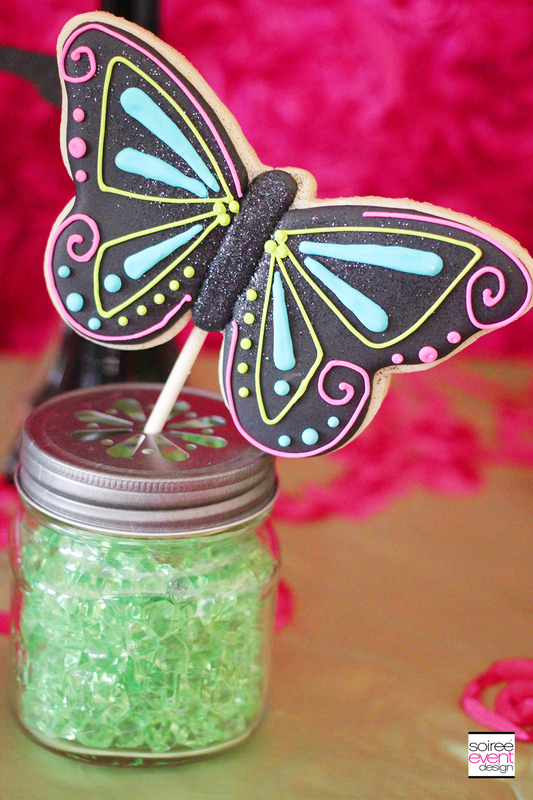 Loving the crafty ideas of this party!! So many cute details!! Thanks so much for linking up to our Sunday LINK PARTY at Bird’s Party Blog!! Ah it’s so pretty. I love that you had a craft table. great idea. I love the color. suits for a princess. Such a cute theme, love that they all dressed up for it! Great Party Ideal! That is adorable! Congratulations!